Parks Candles’ scent number 4, which comprises of passion flower and vanilla, is one of our most combinations popular and for a very good reason. It is uniquely relaxing and welcoming, and can make any space feel like ‘home’. 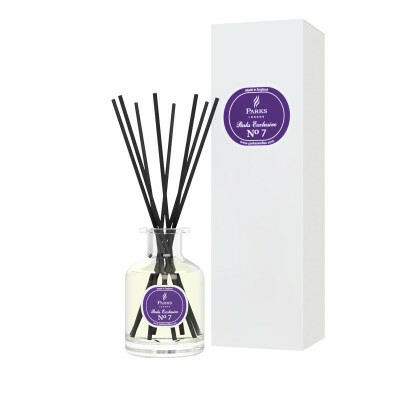 This reed diffuser kit comes with everything that you need to distribute the scents of vanilla and passion flower throughout your home or any other space, including sufficient scent to last up to 14 weeks, a decorative mini-vase and a set of all-natural, responsibly harvested reed diffuser wands. These will carry the delicate mixture out into the air around you without smoke, grease or any of the contaminants that might aggravate asthma or breathing conditions. The first scent that you notice is of vanilla. It’s strong and bold, but never fails to relax us. This is because the distinctive scent is closely tied to a sense of belonging and holidays, no doubt because of its close association with baking. Next comes the more subtle and complex scent of passion flower. This has been described as an eminently sophisticated fragrance, which forms an amazing counterpoint to vanilla’s brashness. The two together can completely change the character of a living space, making it more welcoming, inviting, and more like home, no matter where in the world you find yourself. This diffuser set comes wrapped in a high-quality gift box, so it can be presented as a mysterious, but gently scented surprise that is suitable for any friend, family member or loved one.